Norbert’s Springboards incorporate cutting-edge technology, time-honored craftsmanship, the finest materials available and designs that draw on decades of experience in the field. Norbert’s Springboards are fabricated from finished 3/4" baltic fir plywood, renowned for strength and resiliency; tops are padded with closed-cell foam and carpeted. Finish carpentry, sealing and upholstery involve a dozen separate steps, all done skillfully and precisely by hand in Norbert’s woodworking shop. 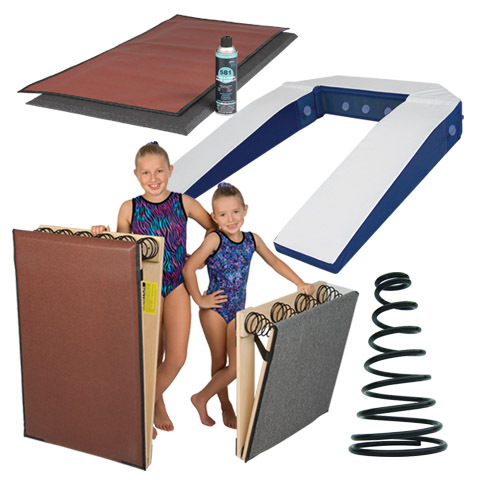 In addition to our G-193 Junior Springboard and G-192 Mini Springboard, Norbert's also offers two AAI Stratum Vaulting Boards as well as replacement springs for all of the above. This category also includes Norbert's unparalleled Springboard Dock, our handy Board Bag and Springboard Recovery Kit.